Hello, all. It has been a while and I have missed you despite seeing even more of you than usual during April. I missed you and our regular blog. When I go dark, that’s one thing. I’m expecting the break and I miss you somewhat. This time, I had no plans to not post regular blogs. Silly me. April is certainly something. I’m already torn about next April. The thing of which I am proudest [closely followed by writing a random-ish poem for NaPoWriMo, every day ] is the Pulitzer Remix, of which you have heard me speak often. Some of you followed me on the journey and I much appreciated the company. The experience of the Remix was enough of a game-changer in my life that I may come back to it every now and then and beg your indulgence. Should any of you be curious, I now have a tab at the top of the blog: My Pulitzer Remix Poems. There are thirty links which, hopefully, open in separate tabs. You might enjoy a dip. On Tuesdays I post a prompt, or exercise, for you to write to. The result never has to be a ‘finished’ draft and can be posted anytime. If you have a blog, that’s where you post, leaving a link in comments. If not, comments is an alternative. I try to remind people to go back after a few days to read. I will always read. 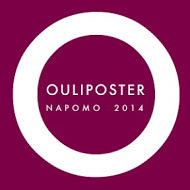 On Thursdays, I post links to places of interest to us as poets or, more generally, as writers. I will sometimes use the space to discuss an aspect of poetry. Having been through most of what this blog might cover, in the last couple of years, I haven’t done that as often, recently. You, as readers, may always send me a suggestion, question, knotty problem and ask me to take it up on a Thursday post. On Fridays, I have a selection of sites that give out weekly prompts, and I post them with a general comment on the prompt, so that people can come to one place to check and to see if they wish to go further and visit the prompt site. The article is titled, ‘Slow Down Your Hectic Writing Life With a ‘Pause’ Button’ from the site Write to Done. I thought that sounded perfect for this moment. I don’t think I even need to add commentary, except to say nothing is new, but we still need reminding. Snarl. You know those days when you start behind? Two hours at the dentist removing a crown started my day. The forecast says maybe snow. SNOW! Home now and can’t have my second cup of coffee until the temporary crown has settled. Grump. Hello all. Thank you. I just needed someone to growl at. We have two things today, each of which some of you know about. It’s that time of year: National Poetry Month, when all sorts of nifty poem things happen as we celebrate our passion. I’m talking about two, today. The first is something all who participate look forward to, The Big Poetry Giveaway (which you will never see me call the same thing twice). Started by Kelli Russell Agodon, a couple of years ago, the Giveaway is being guest curated by Susan Rich. Last year, about 50 or so bloggers each gave away 2 books [or more] to their readers. Some bloggers gave away subscriptions to poetry journals. For more, visit The Alchemist’s Kitchen. 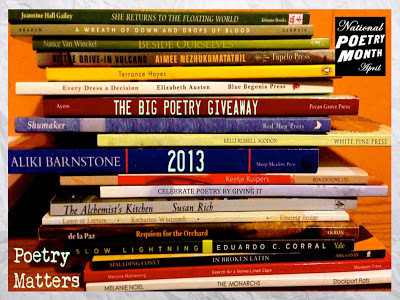 The official start of the Big Poetry Giveaway is now and will last through April 30, 2013. I have a diverse collection this year. Cati Porter, of Poemeleon, has her new chapbook, The Way Things Move The Dark, out. Dave Bonta, of qarrtsiluni, has a lovely collection of Odes to Tools. Finally, poet, Jee Leong Koh’s chapbook, Seven Studies For A Self Portrait, is fascinating. Sound good? Well, put your name in the hat. That took longer than I expected. I shall save my talk of the second item for next Thursday. I will, however, give you a link to the press release about the challenge I am involved in, for April, Pulitzer Remix. See you tomorrow for the Roundup; next Tuesday for our image prompt; and next Thursday, for some thoughts on the Pulitzer Remix. Maybe if I drink sips from my un-numb side.